THE STL FILES ARE IN THE DOWNLOAD SECTION. YOU MUST BE A MEMBER TO SEE THIS. I'm just finishing off a micro mavic.. my mini decided to take up smoking.. oops although is did look awesome going down in a pool of smoke. I think the motors were pulling to many amps and the jst cable I used couldn't take it... Oh well. Will release the new micro mavic soon. :-). Can't get much smaller. 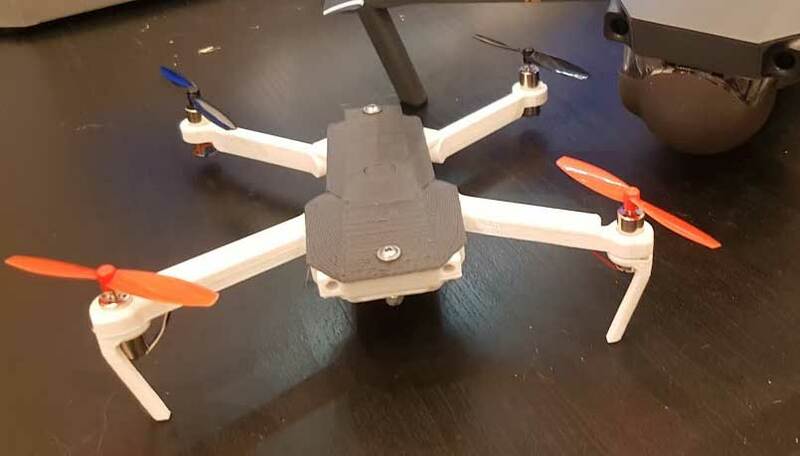 I am currently building the Mini Mavic with this board: https://www.banggood.com/Eachine-32bits-F3-Brushed-Flight-Control-Board-Based-On-SP-RACING-F3-EVO-For-Micro-FPV-Frame-p-1076530.html Really like it because of it's size and price! Definitely recommend it! Hey, it was really steady. I've finish my Micro mavic now but just waiting on some components. I guess it's ready for released to be honest.. The micro version uses 1S 500mAh batteries which you can get 5 for £10 :-) including a usb charger so really cheap. You should try Turnigy nano-tech 1S 750mAh 70C from HobbyKing. Gives you an extra punch. So you did not go for 2s? Yep, the mini has room for a 2s.. the micro, just the 1s..
Hello! Will it fit 18650 li-ion cell?